"Deck The Halls", originally called, "Deck The Hall", is a Christmas Carol, that is for New Year's Eve. The idea that Christmas hails the new year, is brought to light in this song. It was originally a Welsh poem, translated into English by Thomas Oliphant and published in 1862. "While I sing of beauty's treasure", and, "Laughing, quaffing all together". See the wikipedia article, if you are interested in reading about the variations. I was wondering what this song was all about. I get it about, 'tis the season to be jolly'. And that is true right now. We are in a season of joy. And the world is trying to convince you otherwise. Holly symbolizes masculinity. And ivy symbolizes femininity. There is another Christmas Carol called, "The Holy and The Ivy". But this song is about putting up holly throughout your house. The word 'holly' is not connected to 'holy', but 'prickly'. Holly has leaves with sharp, prickly ends on it. 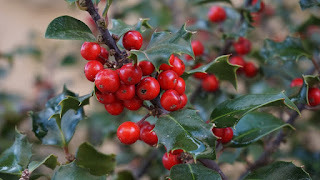 The vibrant, red berries on holly are also associated with masculinity and the blood of Jesus. In ancient times, holly leaves were used as a tea, to treat arthritis, kidney stones and bronchitis. Some people believe that the crown of thorns that the Roman soldiers put on Jesus' head was holly. This may be a myth, but the symbol of the holly and it's similarity to the thorny vine used as the crown of thorns put upon Jesus' head remains. "There are hundreds of species of holly plants (Ilex), and the plants come in all sizes, ranging from spreading dwarf holly shrubs 6 inches in height to holly trees 70 feet tall. Their shapes vary from rounded to pyramidal to columnar. Landscaping enthusiasts use this versatile plant in a number of different ways, including as foundation plantings." "As well as playing a key role in a woodland's winter ecology, holly has a strong cultural resonance amongst humans. Festive holly imagery on Christmas cards may be a Victorian invention, but the tree's association with Christmas goes back to pagan times, when it was customary to bring holly boughs in to deck out the house. Holly was seen as a powerful fertility symbol, and was believed to be an effective charm to ward off witches and ill-fortune: for this reason it was often planted close to homes and outbuildings. Conveniently, its thorny foliage and blood-red berries lent themselves to Christian tradition, and the early customs surrounding the species were fully adopted by Christianity. With its intense red berries, the holly was also seen as a very masculine plant – after all, "the holly wears the crown" – though the fact that hollies with berries are always female seems to have been conveniently forgotten by some in society." "the holly is held by tradition to be of the same plant as the wood of the Cross was said to come from. During Advent and Christmas Christians acknowledge the need for a Savior and holly reminds them of this: the holly bough is one of St. John the Baptist's symbols; the Saint heralded our Lord's coming as Isaiah did in the Old Testament."